This month the hosts of our Business After Hours networking event is Acutech. Acutech is a welding shop located in Columbia Falls. They produce high quality, custom metal manufacturing projects. Acutech joined our Chamber in January 2017. We are proud to have them as members and are looking forward to seeing their facility and projects at our Business After Hours this month. Business After Hours provide a place to network with other business professionals, unwind after a long day of work and socialize with free food and drinks! Bring donations for the Columbia Falls Food bank. The more donations you bring, the more raffle tickets you get! 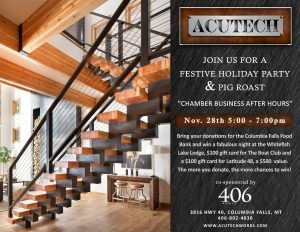 Raffle items include a one night stay at the Whitefish Lake Lodge, a $100 gift card for the boat club, and a $100 gift card for Latitude 48. See you at Acutech on November 28th!